Food Costs > How Much Does it Cost to Butcher a Cow? How Much Does it Cost to Butcher a Cow? Whether you own a vast farm with cattle or you have purchased a cow and needs to be butchered, there is a tremendous amount of meat that can be obtained from one cow. However, retrieving this meat is not going to come cheap if you were to hire a local butcher. The cost to have a cow butchered will depend on the size of the cow, the butcher doing the job, how you want it processed and geographical location. In most cases, the costs will be fairly straightforward. The kill fee alone will be between $25 to $50 before the processing even begins. For the entire wrapping and processing, the prices can range anywhere from $0.40 to $0.80 per hanging weight pound. According to GrannyRetreat.com, the cost associated with butchering a cow is not just only about having it killed and butchered. A big portion of the cost will go to the processing process. Although the prices are subject to changes, one can expect to pay around $1,100 for half the beef, including the processing. The said price range is inclusive for the price of the cow itself. In the event that you have a cow of your own, then the price will be less. On this Familycow.proboards.com forum thread, members asked what it would cost to butcher a cow, and quotes ranged anywhere from $0.30 to $0.49 per hanging weight pound. The process of butchering has changed over the years. Gone were the days when butchering animals were done inhumanely. Today, the modern ways of butchering starts by sedating the cow with an electric shock and then cutting the carotid artery and jugular veins in the neck. Other butchers also use the combination of the two processes by injecting a metal slug into the cow’s head. Other more traditional and experienced butchers just simply shoot the cow between the eyes with a rifle. The head is then removed using a knife. After the cow is killed, the carcass of the animal will be hung from a gambrel, a device that resembles a hook. After, the butcher will then cut from the inside out in order to remove the skin. When the skin is completely removed, the butcher starts removing the cow’s organs and removes the meat from the butchered animal, processing it into the appropriate cuts for you to take home. In the end, plan on getting close to 50 to 60 percent of the cow’s weight in meat. If your cow weighed 1,000 pounds, then it’s safe to assume you would come home with 500 to 600 pounds of processed meat. Normal beef processing will usually include steaks, roasts, ribs, soup bones, the liver, heart, tongue and ground beef. If you want the butcher to deliver your processed meat to your home, then a delivery charge may apply. The same can be said with a trip charge if you needed the butcher to pick up the cow before processing. For example, some butchers may have a flat fee, while some may charge $0.50 to $1 per mile. Most butchers will have standard packages, explaining exactly what you’re going to get in terms of cuts; however, if you were to want a premium cut such as sausage or a special cut, then the processing fees could increase. 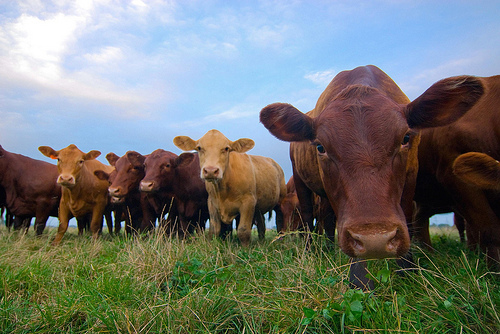 A typical cow can yield 18 different cuts of meat and a total yield of about 750 pounds. However, the number of cuts may depend on the method of butchering employed. Like pigs, butchering cows can be easier if the food will be withheld a day before butchering. If you choose to let the animal eat during their last day, you need to be extra careful with the guts when dissecting. It is always easier to butcher an animal if it has an empty stomach. You must keep in mind that your yield will be affected by the way you want your meat to be processed. If you opt for a boneless cut, for example, you will receive less; however, you may have a higher yield if you were to keep the bone. Like any service, compare and talk with a few butchers before making your decision. As long as you have the cow’s weight, most should be able to give you a solid estimate over the phone. Some shops may offer special promotions, whereas others may offer a discount to returning customers. As long as you compare at least three to five butchers, you can be assured you’re getting the best quote. I guess it depends on how much meat you get back. I got 275 pounds of meat. It was more than I was led to believe.